In 100 Episodes, The A.V. Club examines the shows that made it to that number, considering both how they advanced and reflected the medium and what contributed to their popularity and/or longevity. This entry covers Scrubs, which ran for 182 episodes from 2001 to 2010. 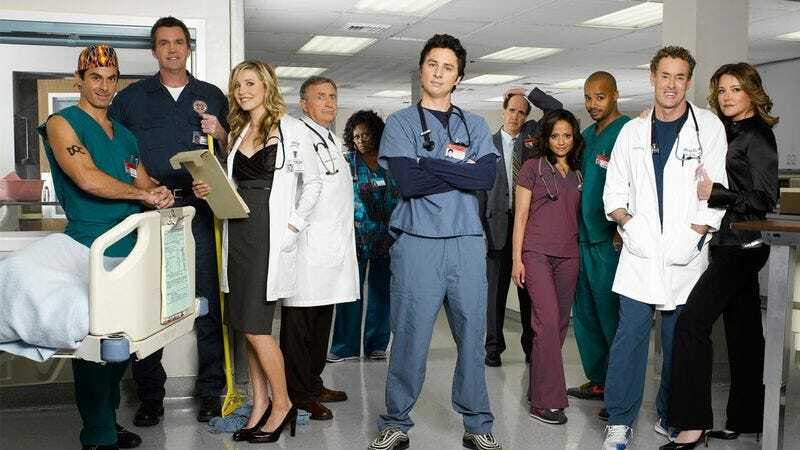 Fifteen years since it debuted, it seems clear that Scrubs is a pivotal show in recent television history, even if it lacks the lasting popularity of The Simpsons or the acclaim of Arrested Development, two shows it bridged to a certain extent. The show was set at the Sacred Heart teaching hospital, and mostly followed a group of medical interns—referred to as “scrubs” because of their uniforms—as they struggled to put their newly completed education to use. Zach Braff, in his breakout role, starred as John “J.D.” Dorian, a competent doctor, goofball, and extremely emotional guy. J.D. forms relationships of desperate intensity with everyone around him: best friend and surgeon Turk (Donald Faison), professional rival and on again/off again love interest Elliot Reid (Sarah Chalke), and most intensely, chief resident Perry Cox (John C. McGinley), who J.D. makes a mentor and father figure over Cox’s overwhelming opposition. (J.D. can’t do this all on his own—he’s no Superman.) Surrounding them are nurse Carla Espinosa (Judy Reyes), who’s the hospital’s most efficient employee; Bob Kelso (Ken Jenkins), Sacred Heart’s penny-pinching and gleefully dickish chief of medicine; and an unnamed janitor (Neil Flynn) with an unwavering and mostly undeserved grudge toward J.D. Elliot: Why, because he’s afraid of speaking in public? Kelso: No, his depression finally got the best of him and he hung himself. As for its own influence, two shows that are quite different and innovative in their own ways nonetheless seem indebted to Scrubs: 30 Rock and How I Met Your Mother. The former is a high-velocity, cameo-filled comedy, with more scenes and gags than would be possible in a traditional sitcom format, and which happily exaggerated reality or physics for bigger laughs and better pratfalls. Outsized though it was, it was also founded in reality; just as Scrubs creator Bill Lawrence based characters and patients on real people, Tina Fey drew on her time at Saturday Night Live for 30 Rock. The latter is a deeply sentimental comedy that’s obsessed with big questions and heavily soundtracked for emotional epiphanies. Like Scrubs, Mother was very subjective thanks to the ubiquitous narration of its protagonist, and partial to playing around with structure and declaring rules. There are even some similarities in the characters, and you can trace a particular outsized type from NewsRadio’s Bill McNeal to 30 Rock’s Jack Donaghy through Perry Cox. Like McNeal, Cox was a gold medalist in sarcasm and egoism, given to outsized vocal inflections and imitations in his mockery. Like Donaghy, he was a hyper-verbal insulter who was among the best in his profession, and while he did have his protégé’s best interests at heart, he also ripped on him for failing to live up to traditional gender roles. There’s a lot of Tracy Jordan in the janitor, a scheming agent of chaos who speaks primarily in non sequiturs, and of Liz Lemon in Elliot Reid: Both are romantic failures who are good at jobs they often dislike; both shows make jokes about their bad feet and German fluency, a symptom of their type-A personalities. It might be a stretch to say that Mother’s Barney Stinson was a rip-off of Scrubs’ “The Todd” (Robert Maschio)—another high-five-loving horndog who frequently refers to himself in the third person—but there’s no denying the connection between J.D. and Ted Mosby. Both are gooey romantics and nerdy dreamers, and both divided audiences into camps that either found them appealingly sincere—J.D.’s bar toast: “To buddies!”—or appallingly insufferable (both are narcissistically obsessed with their hair). It can’t be a coincidence that Sarah Chalke is also a key part of the Mother mythos, where she played another doctor. Scrubs’ DNA can now be seen across the TV landscape. Years before It’s Always Sunny In Philadelphia’s most experimental episode, Scrubs retold its own stories in season five’s “My Déjà Vu.” Well before Community, it used the idea of genre episodes, notably with a musical half hour (featuring eight original songs from the Avenue Q songwriting team), but also with a fantasy episode and one based on The Wizard Of Oz. This isn’t to say that those subsequent shows wouldn’t exist if not for Scrubs, but to watch it is to watch pop culture evolve. The show straddled both the “very special episode” tone of ’80s sitcoms and the joke-a-minute style that dominates the single-camera era, whose fleet visual style it helped establish as a commercially and critically successful option for network broadcasters. It fused elements that were as old as TV comedy itself—catchphrase-sporting wacky characters and will they/won’t they romances—with the modern addition of cutaway scenes for fantasy and dream sequences. It wasn’t afraid to change its tone from episode to episode, or to hand off narration duties to supporting characters (in the occasional “His Story” episodes), but it was also such a slave to structure that the stories ending on down notes whiplashed to jaunty closing-credit music played over a montage of the half hour’s wackiest moments. Episodes basically stood alone in their storytelling, though it grew more serialized as it went on, and told multipart stories when needed. Ratings-wise, the show peaked in its second season, when it nearly cracked the top 10, though it saw a sharp decline in popularity from the fourth season onward. NBC canceled Scrubs after it fell past 100th place in its seventh year on the air; ABC, whose studio arm had produced the show from the start, stepped in to air another two seasons. Despite providing early onscreen work for Dave Franco and Eliza Coupe, those seasons deserve their footnote status: The show’s main characters only appear a few times, and the episodes’ running-on-fumes nature is evident. Plus, they nullify what would have been one of the stronger of recent sitcom finales. Where Scrubs stands out is in its life-or-death stakes, something absent from both the shows it drew on and the shows that drew on it. Referring to patients they’ve lost, the characters will bluntly say they’ve killed people, a frankness that could sit uneasily alongside the broad comedy but doesn’t—because it isn’t whiplash so much as compartmentalization. It isn’t explicit about it like M*A*S*H*, but Scrubs was about doctors using humor and fantasy to escape the stress of their jobs, and about them using medicine as a way to feel in control. As early as episode four, the series highlight “My Old Lady,” the show was underlining the enormous gravity and responsibility of the job, as well as the lack of sentimentality in hospital outcomes. Throughout Scrubs’ run, doctors and nurses suffer from the guilt of making mistakes or overlooking symptoms, emotional blows that couldn’t be brushed off. In “My Screw Up” or “My Long Goodbye,” the characters find that their experience with death can’t prepare them for when a loved one dies, while the season six arc with a wounded Iraq War veteran leads to frank discussions of suicide. Though, in another example of the show’s ricocheting tones, those frank discussions are intercut with warring versions of a memory. Even Cox cracks under the pressure in “My Lunch,” the start of a multipart story where he sinks into a depression after three organ recipients die on his watch. Because death was a constant presence on the show, Scrubs was inordinately concerned with what it means to live a worthwhile life, a subject that lends itself to ecstasy and profundity in equal measure. When the unique alchemy of its frivolity and emotion were in sync, Scrubs produced some of the best sitcom episodes of the 21st century. It also wasn’t afraid to get wonky. Storylines tackled big topics like industry sexism, the role of money in medicine, and right-to-die issues, as well as more granular ones: the question of whether a patient is a scheming addict or in genuine need of painkillers, a surgeon not wanting to perform a risky-but-necessary procedure for fear of hurting her success stats, and aging doctors endangering patients by adhering to outdated treatment techniques. Personal and philosophical rivalries existed between the doctors and nurses, the surgical and medical teams, between the staff and administrators. Those who work in the medical field have described it as one of the most accurate televised depictions of the industry, and that gives it a complexity that hasn’t been replicated, especially compared to recent conflict-averse comedies. The equivalent today would be a show like Brooklyn Nine-Nine dealing explicitly with police brutality or racial profiling. It could handle these weightier topics, but Scrubs wasn’t good with edgier humor. The bits about race range from cringeworthy to worse—as in a misguided blackface joke—and the show rarely did right by its female characters. While Elliott began in the competent-and-committed-yet-vulnerable Liz Lemon/Leslie Knope/Amy Santiago template, she became over-the-top as the show went on; it’s genuinely dispiriting to watch her initial nuance and insecurities devolve into storylines where she’s boy-crazy about bland love interests. There’s also something ugly in the soap-opera arc given to guest star Elizabeth Banks, who lies about having a miscarriage, or in the generally monstrous depiction of Cox’s ex-wife, Jordan (Christa Miller). Those issues are symptomatic of how the show, like most long-running comedies, grew untenably broad with time. Its fantasy sequences moved from Ally McBeal-esque exaggerations—to illustrate Elliot’s “put me in, coach!” enthusiasm, season one showed her in a catcher’s uniform—to extended Family Guy-style cutaway gags. But at its best, that broadness coexisted with the drama. In the finest moment from “My Musical”—perhaps the show’s finest half hour—the gang’s self-centered oblivion is forced to a screeching halt by a patient asking the simplest of questions—what’s going to happen? As everyone regains their bedside manner, Scrubs’ place in history becomes clear: No other show this goofy ever hit the tear ducts this hard.